The hand-painted Sweetie Pie pattern represents floral motifs in cobalt blue with a tangerine orange center and accented with three-leaf designs. 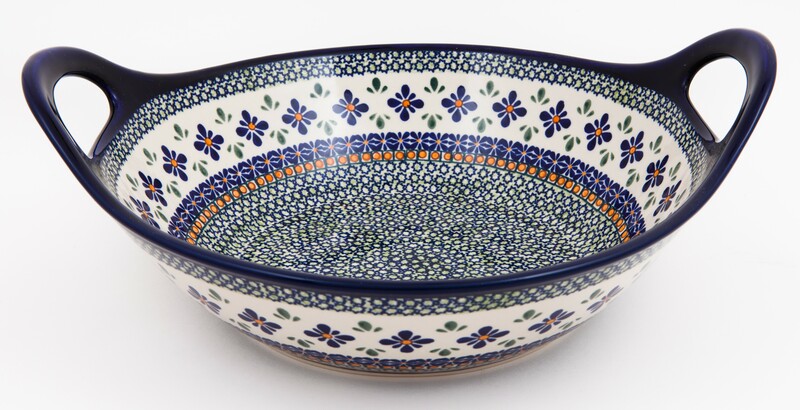 Hand-painted by skilled artisans of Zaklady Ceramiczne “BOLESLAWIECE” factory, this complex modern pattern is further surrounded by eight start motifs on one side and a layer of cobalt blue flower motifs with brown center dot and brown boxed circular motifs on the other side. The exquisite colors and design hold some complexity that is indicative of the fact that the intermediate artisan is striving towards mastering the art. The amazing beauty of the peacock’s feather is blissfully captured in this modern pattern to add a touch of beauty to your table. *Microwave,oven,freezer and dishwasher safe. *Each Item is certified to bake up to 480 degrees and will make everything you cook a work of art! *Stoneware must be room temperature prior to use in a microwave or hot oven. Avoid drastic temperature swings. *Do not put close to the heat source such as the broiler or bottom of the oven.